DURHAM, N.C. – North Carolina Central University junior Corey Joyce (Lexington, N.C.) was named MEAC Player of the Week after he set an NCCU modern era record by picking up six hits against Bethune-Cookman, the league office announced on Monday, March 18. Joyce batted was only put out once during the week, as he went 9-for-10 including his 6-for-6 night against the Wildcats. In the series opener at BCU, Joyce also picked up a home run and four RBI, and over the course of the week he touched home seven times and slugged an outstanding 1.200. Over the course of the year, Joyce leads the Eagles at the plate with a .439 batting average, and is slugging .712 with three doubles, three triples, and three home runs with 11 RBI. 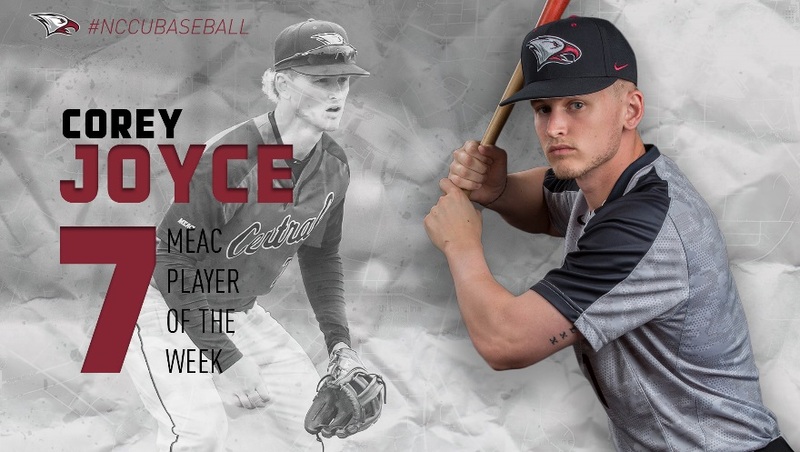 This is Joyce’s first weekly honor of the 2019 season, and the fourth overall for the Eagles. Ryan Miller (Blandon, Pa.) has been named Rookie of the Week three times, but this is the first Player of the Week award for NCCU this campaign. The Eagles are next on the road at Appalachian State on Tuesday, March 19.